Location: Tula de Allend, Hidalgo, Mexico. 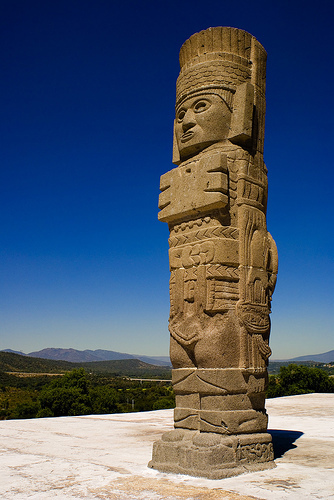 Grid Reference: 20° N, 99.33° W.
Tula is generally accepted as the legendary capital 'Tollan' of the Toltec empire,, founded around 750 AD, at the same time as the Teotihuacan empire was in decline. The centre of the ruined city consists of a plaza bordered by a lavishly decorated pyramid temple. 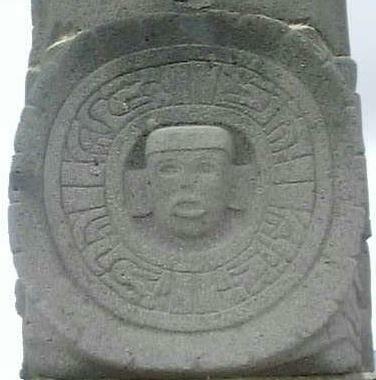 The site also contains palace complexes and courts for the ritual ball game played throughout ancient Central America. In the 11th century, Toltecs who emigrated from Tula are believed to have settled on the site of the former Mayan city of Chichén Itzá on the Yucatán peninsula, where they put up buildings in the Tula style. The ruins at Tula share many architectural, artistic and religious influences with the Maya city of Chichén Itzá, some 700 miles away (by land) on Mexico's Yucatán peninsula. 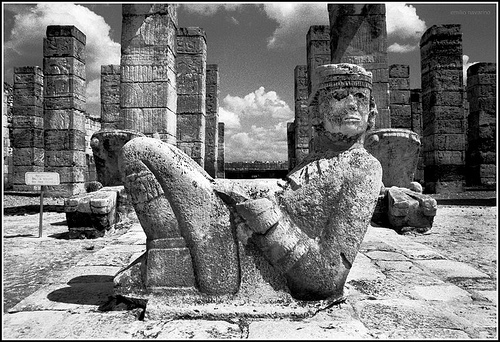 For years, scholars believed that the warlike Toltec had invaded distant Chichén Itzá and imposed their own culture. Today, however, most archaeologists believe that Toltec Tollán was one of many cities with whom the advanced Chichén Itzá traded and the common influences flowed from Chichén Itzá to Tollán. Whichever the direction of the cultural flow, there are several distinct similarities between the two cities. 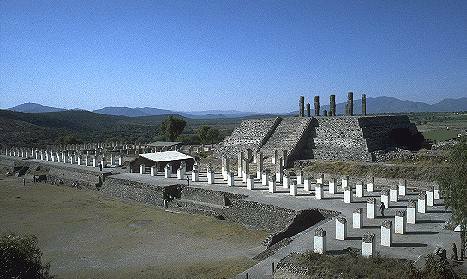 The major structure that remains today from the ruins of Tollán is the Temple of Tlahuizcalpantecuhtli (Lord of the House of the Morning Star) – referred to today at the site with more mundane (and more pronounceable) name of "Pyramid B." At the top of this pyramid stand four colossal statues, more than 15 feet tall, dressed as warriors. They may represent the Toltec ruler Ce Acatl Quetzalcóatl (who was named after the fair-skinned god worshiped by many Mesoamerica cultures). These four figures wear stylized butterfly breastplates, sun-shaped shields on their backs, feathered headdresses and carry spear throwers and a supply of spears. They once served as pillars to support the roof of a temple that stood atop the pyramid. Along the base of the pyramid (on the side opposite the stairs) many Toltec carvings of jaguars, eagles and human skulls are still visible. At the foot of the stairs is an L-shaped colonnade that once supported a roof that may have provided a shaded passageway for the priests and nobility from the main pyramid toward the smaller Pyramid of the Sun (or "Pyramid C") to the east. Little remains today of Pyramid C. To the west of the main pyramid is the Quemado Palace (also known as the "Burnt Palace"), which today is little more than a foundation that once supported three large rooms and a forest of truncated pillars that once supported a roof. These four immense statues still stand on the top of pyramid-B. 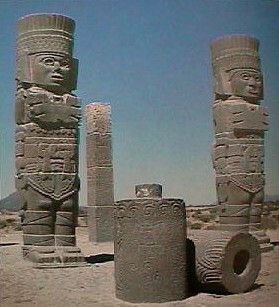 They stand over 17ft (4.6m) high and are suggested to have once been supports for a temple. 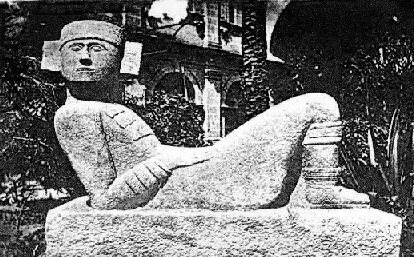 The word 'Telamon' is a generic term used for any human figure used as a structural support. 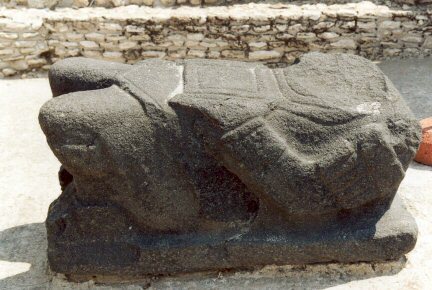 Tula's east-facing great warrior statues, are apparently representations not of Tezcatlipoca, but of Tlahuizcalpantecuhtli, the Plumed Serpent in his guise as Morning Star. The discs on the backs of the statues (left), and the so called 'Ray-guns' (right). The most interesting of the other buildings is perhaps Coatepantli, or the wall of the snakes, whose name comes from the reliefs on the north face of the pyramid, which shows snakes eating human beings. 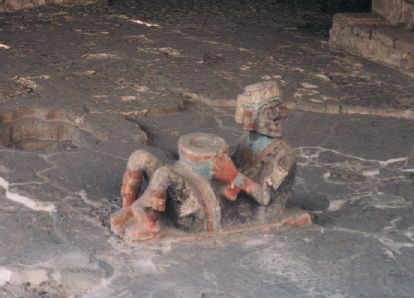 Near, in front of the Palacio Quemado (Burnt Palace), we find the Chacmool, an inclined statue of a priest on whose chest there is a bowl where they deposited the offerings to the gods. There were once seven Chacmool at Tula, with only one remaining complete today..
Two Chacmool's in Front Of The Palacio Quemado (Burnt Palace). 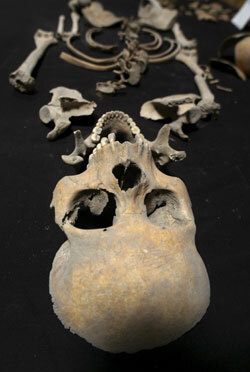 Article: April 2009 - 'Bones of children are displayed in Tula, Mexico'. Bones of children are displayed in Tula, Mexico April 19, 2007. The grisly find of the buried bones of 24 pre-Hispanic Mexican children may be the first evidence that the ancient Toltec civilization sacrificed children, an archeologist studying the remains said on Monday. The bones, dating from 950 AD to 1150 AD and dug up at the Toltecs' former capital Tula, north of present day Mexico City, indicated the children had been decapitated in a group. Skeleton being eaten by snake. 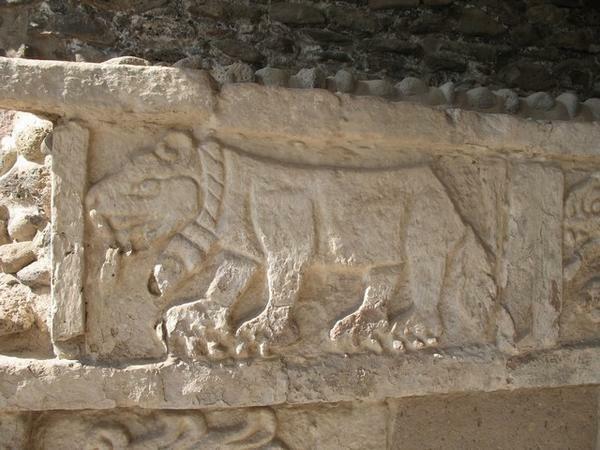 Carved captive Jaguar at Tula.